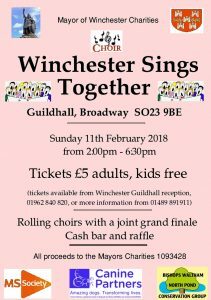 Winchester Community Choir will be one of a number of choirs singing together on the afternoon of Sunday 11th February to raise money for the Mayor’s Charities. The event will run from 2pm to 6:30pm at Winchester Guildhall, and tickets are £5 for adults, available from the Guildhall reception. Admission for children is free. Proceeds will be split between the MS Society, Canine Partners, and Bishops Waltham North Pond Conservation Group.